Nice box. Nice band. Nice notes inside. Nice evil eye included. On to the particulars of this leather good. 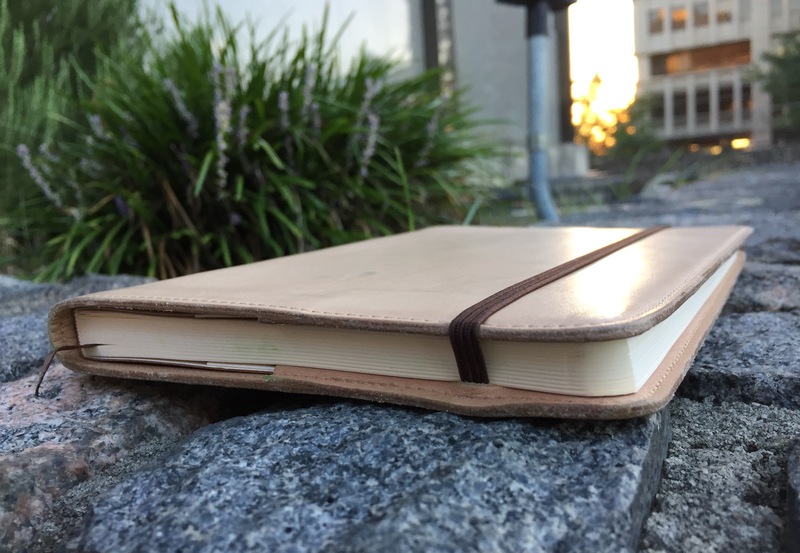 Designed to fit pocket size notebooks, this cover has a total of 3 pockets, a card holder, a pen loop, and a thick elastic band to hold the notebook in place and wrap around the whole contraption. The leather is thick and beautifully dyed, neatly hand-stitched with burnished edges. I’m pleased that this cutout was done on the edge to neatly fit the leather band that connects to the pen loop, but overall the functionality of this pocket structure eludes me. An iPhone 6 is a tight fit for the pocket, and only then if it has no case on. With a phone in the pocket, I can’t get a card in the card slot. The phone isn’t in any way usable in the pocket, so why put it there? What do you put in this pocket? I originally thought I didn’t have any notebooks slim enough/small enough to fit. So I purchased from Goulet Pens some of these impossibly tiny Apica notebooks, which are quite perfect for this pocket and boast fairly fountain pen friendly paper, if you need a small place to jot notes. And of course, after having made this purchase I realized that the little 48 page 3×4.7in Rhodia side-staple bound notebooks also fit. The Apica notebooks fit a smidge better, but both fit. Otherwise what fits here? Receipts? But why carry receipts in here? Maybe some sticker sheets? I’m confident that on the larger formats of this notebook holder that this is a useful and usable pocket, but on the pocket size, it’s much more of a challenge. The two pockets underneath, however, are perfectly sized to hold a passport or a Field Notes sized pocket notebook. Perfect usability here, no creative thinking required, no complaints. Small elastic, big function. Neat picture composition, needlessly high saturation? Too late, post is made. The pen loop is a good size, with satisfying elasticity and grip to it. It’s holding onto one of my clipless Vanishing Points just fine as I write this. I’m not going to test how well it holds the pen were I to drop the whole thing on the ground, but shaking it around vigorously is no issue. The positioning of the outer closing elastic is a consequence of where the elastic needs to be to hold notebooks in on the inside. The direction of use is counterintuitive—in every other notebook of my life, the elastic comes around on the opening side, which is almost exclusively going to be the right hand side. But here, to close the notebook holder you have to pull the elastic around from the spine side, aka the left-hand side (if you pull it around the right-hand side it is incredibly difficult and will probably contribute to an early death of said elastic). The elastic is secure and holds everything firmly in place, it’s just odd. There also isn’t a heck of a lot of stretch in the elastic right now, so it takes a little bit of strength moving in the opposite way of what you would normally…an altogether backward experience. This product took me significantly longer to review because I spent so much time trying to find the right notebook to put in it. Rhodia webnotebooks fit, but just seem a little too thick. Moleskine notebooks are perfect, but the paper is awful. The Leuchtturm1917 is a bit tall–it fits, but I worry it may create a strain on the elastic over time. The back cover of a Field Notes-style pocket notebook is too thin for the elastic to hold it in place. I found a soft-cover Leuchtturm1917 that fit pretty nicely, but I still wasn’t entirely satisfied that this was how to fit this product into my life. For a while I kept a Moleskine Pocket Sketchbook occupying the position of honor, which I liked but was still not entirely satisfied with due to the peculiarities of Moleskine sketchbook paper. Watercolor paper would be better, but the Moleskine Watercolor Pocket Sketchbooks are bound along the short edge, and not compatible with this holder. If anyone knows of a nice Moleskine-style hardcover pocket notebook of sketch or watercolor paper, bound along the long edge, please let me know! Currently I’ve switched back to a Leuchtturm1917 hardcover to use as a bullet journal, but it still doesn’t quite feel perfect. I can see a rather specific configuration that would perfectly suit this setup as a mini portfolio, and if I could travel back in time to when I studied abroad I’d love it: notebook is a Moleskine Cities Notebook. Passport underneath that. Small Apica notebook for random notes. Small Field Notes style blank notebook under that to draw in. Pen of choice in the pen loop. Vaporetto pass tucked in the card pocket?! WINNING AT LIFE! I could still make it happen. My passport’s still good. How much do you think the maps of Venice would have changed in the past…8 years? If you really love Moleskine pocket notebooks and want a nice leather holder, this is a winner. And you can still have a perfectly good experience with other pocket notebooks in this holder. But overall, I’d recommend getting a larger size, like the A5 Galen Leather notebook holder, for a much more easily usable product. First, you get the fancy pens. Then, you get the special inks to put in the fancy pens, followed by the nice paper for writing on with the fancy pens filled with special inks. The pens get carrying cases. Now, we are entering the stage of the illness addiction insanity hobby where the nice paper gets a spiffy carrying vehicle too. A step up from whatever cardboard claptrap it came factory-clad in. No material better answers that call than leather. The leather is soft. Luscious, luxurious, rub it on your face soft. I have a pair of Italian leather gloves that are softer, but not by much. The light color worries me–will I stain it? Will I ruin it irrevocably in some unforeseen manner? But this concern is not unique to this case; I would feel the same about any light-colored leather. 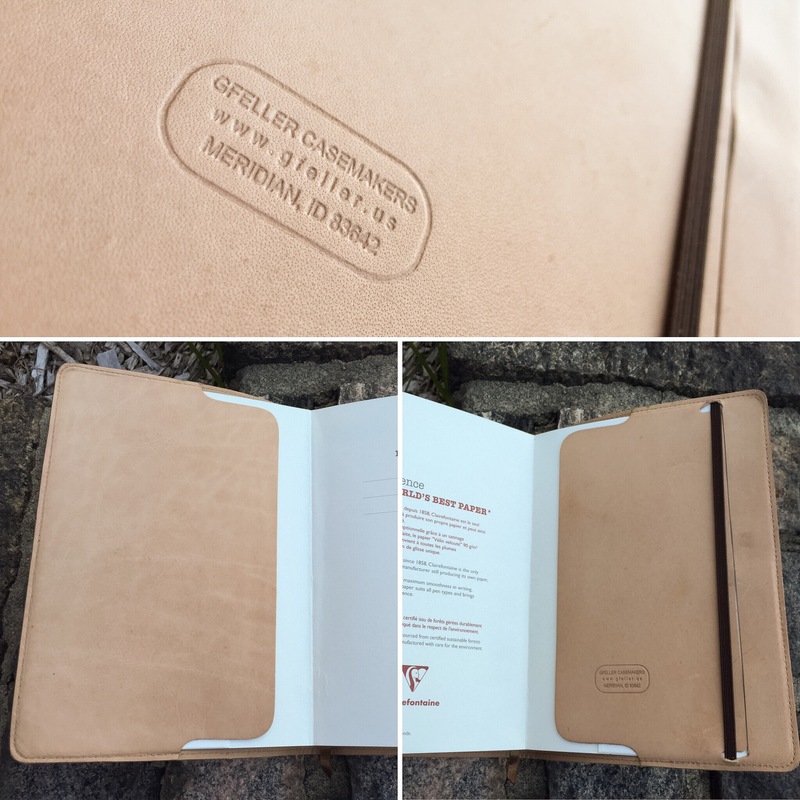 The notebook cover is well-made with smart details–the flaps that the notebook covers tuck into come much further in than I’ve seen on any other notebook cover, to avoid creating a bulge line under the page, and there is a cut out in the back flap to allow use of the elastic band attached to the notebook. It integrates well. The quality is solid. I’m thinking of getting a Gfeller notebook cover for my Hobonichi, I’m liking this cover so much. 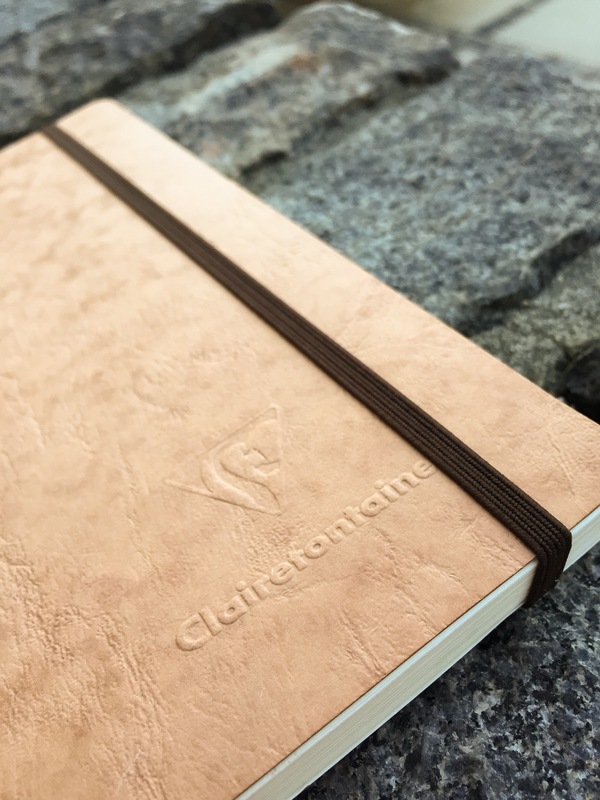 On to the My.essential notebook, which the Clairefontaine people told me is a new product that will be available later this year (or possibly already, the email was a few months ago). I’m kind of surprised that this didn’t exist already in the Clairefontaine and/or Rhodia line-up: a paginated notebook with a table of contents, headers on each page, filled with high quality Clairefontaine 90gsm paper. It really feels like this should have already been around. It’s a wonderfully usable format. In design, the My.essential notebook is very similar to my beloved Leuchtturm 1917. The My.essential is a soft cover with camel-colored leatherlike cardboard pattern, quarter pockets in front and back, and dark brown elastic band and ribbon. It really has everything essential to a good notebook, unless you prefer hardcover. But that’s what the leather notebook cover is for! I have no complaints against this notebook, and hope they’ll be releasing editions besides just lined. Maybe include a 2nd bookmark for bullet journaling? 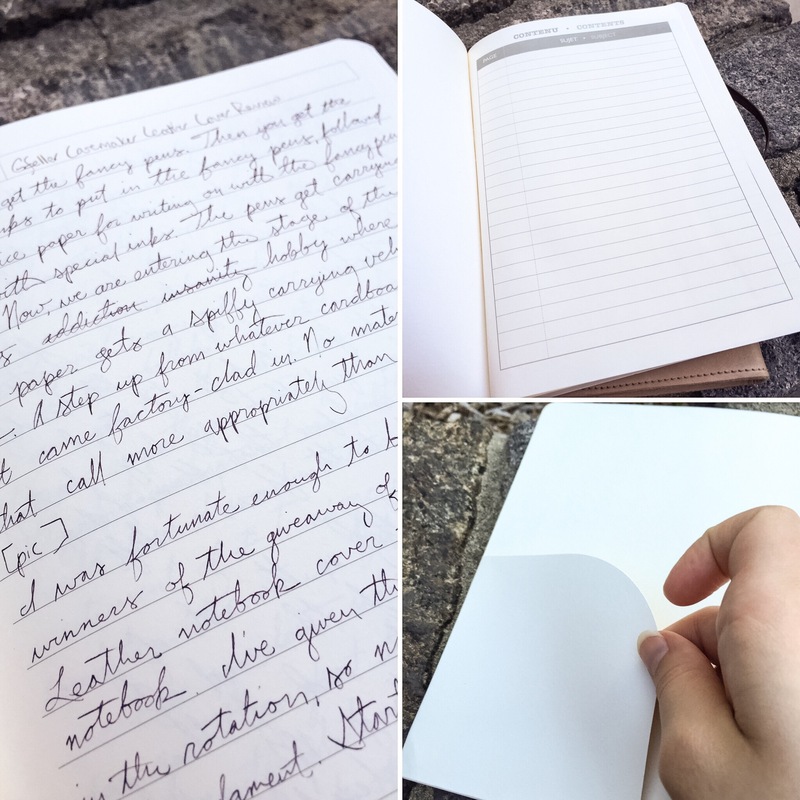 There’s not a whole lot to say; it’s a darn good notebook with fountain pen friendly paper. That’s a Clairefontaine product for you.